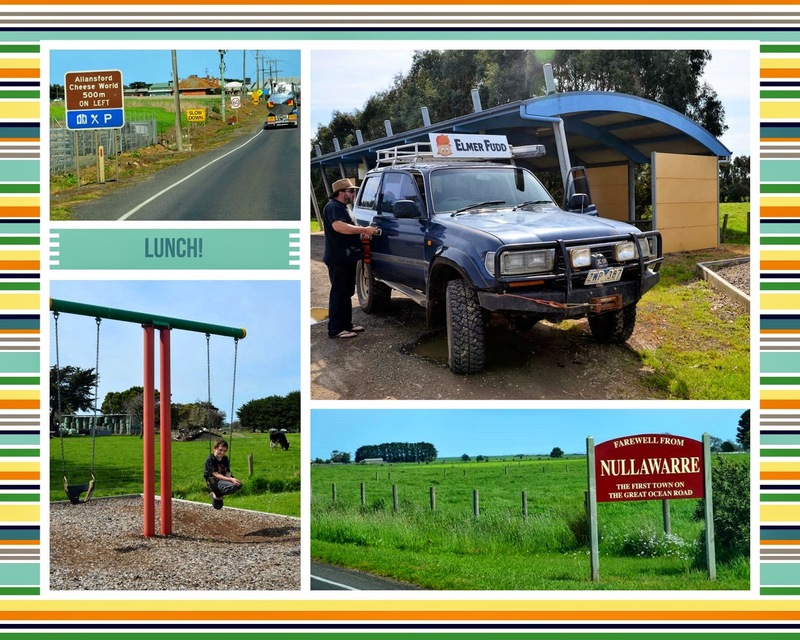 After our wonderful Warrnambool whale-watching we were keen for lunch, so followed Great Ocean Road signs while keeping an eye out for a picnic area. We made a quick stop at Allansford Cheeseworld, where some local offerings were purchased - including a buffalo variety! The roadside paddocks were so green as we drove along. We were amazed to see many jersey cow herds but we didn't spot any buffalo, even though we looked carefully! Nullawarre was billed as "the first town on the Great Ocean Road" and we deemed it an appropriate lunch spot. The picnic shelter backed on to paddocks and we enjoyed watching a large Freisian bull and some of his friends. Our chicken and salad wraps were pretty special - smeared with some locally-crafted soft goat cheese and home-made "pilfered plum" chutney!